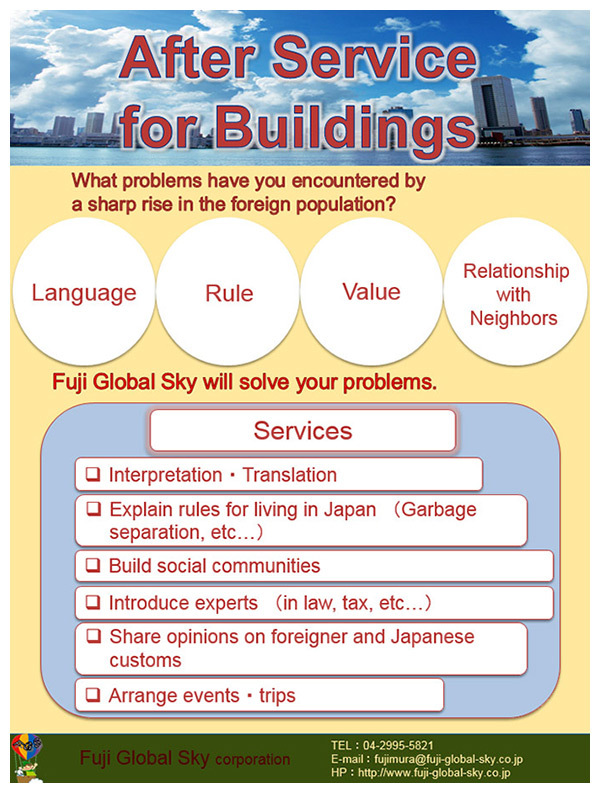 Fuji Global Sky recently launches the "After Service for Building." We all know that there are a lot of Asian customers buying real estate property in Japan. Some of them are investing for reselling purpose, while some customers actually live in there. Foreigners who live in local Japanese neighborhood experience several difficulties, such as language and so on. If there is a trustworthy company that is able to understand each other's language, as well as taking care of cultural gap, both the foreigners and the local would find it very convenient. Similarly, when such problem occurs, the building management company is difficult to resolve them. Therefore, if using our new “After Service for Building”, not only the problem will be solved, the value of the real estate will not be decreased because of the foreigner living there. Fuji Global Sky hopes to assist the building management company. Using our experience in overseas, background, and creativity, we will be able to help improving the business, and assisting foreigners to become familiar with life in Japan as quickly as possible.